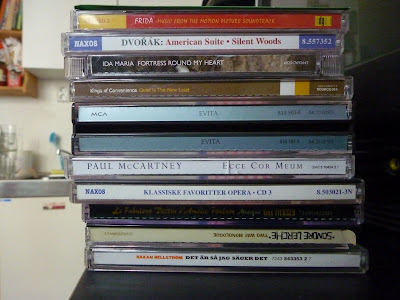 Today I took this picture of the pile of CDs that I've listened to lately. Here they are, uncensored and glorious. The flat green one on the top is a great CD with soul music that Gjøran gave me. Thanks! Under that: The music from the movie about the Mexican painter Frida Kahlo, some lovely Dvorak music, Ida Maria's album "Fortress Round My Heart", the Kings of Convenience classic "Quiet is the New Loud", Loyd Webber's rock opera "Evita", a classical Paul McCartney piece called "Ecce Cor Meum", a collection of opera music by Naxos, the wonderful Amelie soundtrack by Yann Tiersen, Sondre Lerche's "Two Way Monologue" and Håkan Hellström's "Det är så jag säger det". All are recommended! Don't have any of them. I like Grand Island, though.